The divine command to exterminate Amalek—men, women, children, and even animals who have no free will—is what in contemporary terms has been called genocide. 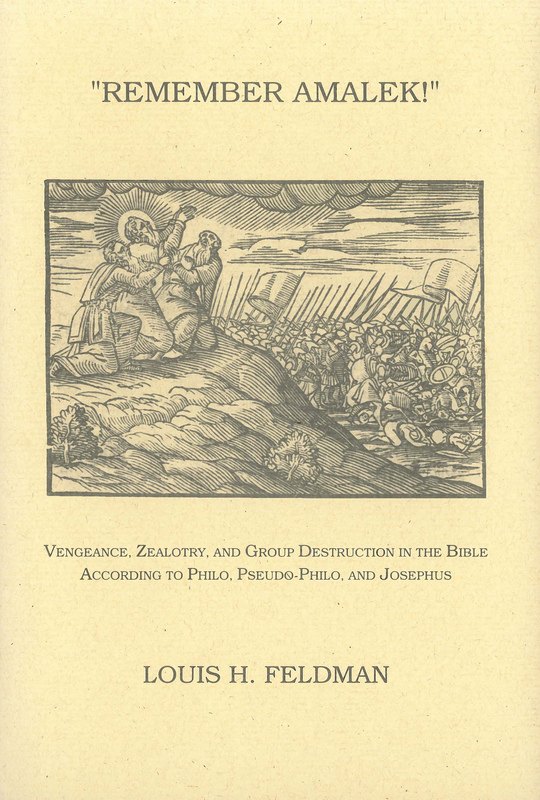 Louis Feldman explores how the earliest systematic commentators on the Bible—the Hellenistic Jewish philosopher Philo in his many essays on biblical themes; the mysterious, still unclassified Pseudo-Philo in his Biblical Antiquities; the premier Jewish historian and polymath Josephus in his Jewish Antiquities; and the Rabbis in the Mishnah, Talmud, and other literature—wrestled with the issues involved in this divine command, especially its provision that an entire people must be eternally punished for the misdeeds of their ancestors. Feldman contextualizes his study of Amalek by considering how these ancient commentators relate to other cases where God commands the destruction of whole groups of people: the flood, the destruction of Sodom and Gomorrah, the plague of the first-born Egyptians, and the command to annihilate the Canaanites. He also studies accounts of mass destruction where there was no specific divine commandment—the annihilation of the Hivites because one of them raped Dinah, the annihilation of the nations of Sihon and Og, the complete destruction of the inhabitants of Jericho, and the extermination of the priests of Nob—as well as the challening issue of why God justifies Phinehas’s zealotry, which involved transgressing the law to kill a Jew and a non-Jew for their immorality. All of these biblical passages raise difficult questions and provide no simple answers. Feldman shows us how ancient commentators received and struggled with Amalek and other genocide passages: Psuedo-Philo had the fewest problems and is most insistent on interpreting the divine command literally, while Philo turned to allegory to resolve the tensions these passages raised with the principle that the innocent should not suffer for the sins of the guilty, and Josephus was concerned to counter the impression that Jews hate non-Jews. Feldman’s study exposes the deep roots of biblical reception in contemporary political and moral issues. Louis H. Feldman is Abraham Wouk Family Professor of Classics and Literature at Yeshiva University. He is the author of 164 articles and eleven books, including Jew and Gentile in the Ancient World (Princeton University Press, 1993) and Josephus’s Interpretation of the Bible (University of California Press, 1998). Professor Feldman is the recipient of the 2003 Cultural Achievement Award for Scholarship in Textual Studies from the National Foundation for Jewish Culture.